I have just posted (on the Social Science Research Network) a revised version of a paper I presented last year in Tokyo at the Ricardo Society Conference on Money, Finance and Ricardo. The paper, “Monetary Disequilibrium and the Demand for Money in Ricardo and Thornton,” will be published next year by Routledge in a forthcoming volume edited by Susumu Takenaga, containing the papers presented at the conference. Here is the abstract of my paper. This paper attempts to provide an account of the reasons for the differences between the theories of David Ricardo and Henry Thornton for the depreciation of sterling during the Napoleonic Wars. Ricardo held that only overissue by the Bank of England could cause depreciatiaon of sterling during the Restriction while Thornton believed that other causes, like a bad harvest, could also be responsible for declining value of sterling in terms of bullion. Ricardo thought that a strict application of the conditions of international commodity arbitrage under the gold standard showed that a bad harvest could not cause a depreciation of sterling, but, applying a barter model, he failed to consider the effect of a bad harvest on the demand for money. In contrast, Thornton’s anticipation of Wicksell’s natural-rate theory did not strictly adhere to the conditions of international commodity arbitrage assumed by Ricardo, allowing for the operation of a Humean price-specie-flow mechanism, but, like Ricardo, Thornton implicitly made the untenable assumption of an unchanging demand for money. I recently wrote two posts (this and this) about the Austrian Theory of Business Cycles (ABCT) that could be construed as criticisms of the theory, and regular readers of this blog are probably aware that critical comments about ABCT are not unprecedented on this blog. Nevertheless, I am not at all hostile to ABCT, though I am hostile to the overreach of some ABCT enthusiasts who use ABCT as a justification for their own radically nihilistic political agenda of promoting the collapse of our existing financial and monetary system and the resulting depression in the expectation that the apocalypse would lead us into a libertarian free market paradise. So, even though I don’t consider myself an Austrian economist, I now want to redress the balance by saying something positive about ABCT, because I actually believe that the Austrian theory and approach has something important to teach us about business-cycle theory and macroeconomics. The idea for writing a positive post about Austrian business-cycle theory actually came to me while I was writing my latest installment on Earl Thompson’s reformulation of macroeconomics. The point of my series on Earl Thompson is to explain how Thompson constructed a macroeconomic model in many ways similar to the Keynesian IS-LM model, but on a consistent and explicitly neoclassical foundation. Moreover, by inquiring deeply into the differences between his reformulated model with IS-LM model, Thompson identified some important conceptual shortcomings in the Keynesian model, perhaps most notably the downward-sloping IS curve, a shortcoming with potentially important policy implications. Now to be able to construct a macroeconomic model at what Thompson called “a Keynesian level of aggregation” (i.e, a model consisting of just four markets, money, output, capital services and labor services) that could also be reconciled with neoclassical production theory, it was necessary to assume that capital and output are a single homogeneous substance that can either be consumed or used as an input in the production process for new output. One can, as Thompson did, construct a consistent model based on these assumptions, a model that may even yield important and useful insights, but it is not clear to me that these minimal assumptions provide a sufficient basis for constructing a reliable macroeconomic model. What does this have to do with ABCT? Well, ABCT seeks to provide an explanation of business cycles that is built from the ground up based on how individuals engage in rational goal-oriented action in market transactions. In Austrian theory, understanding how market actions are motivated and coordinated is primarily achieved by understanding how relative prices adjust to the market forces of demand and supply. Market determined prices direct resources toward their most highly valued uses given the available resources and the structure of demand for final outputs, while coordinating the separate plans of individual households and business firms. In this view, total aggregate spending is irrelevant as it is nothing more than the sum total of individual decisions. It is the individual decisions that count; total spending is simply the resultant of all those individual decisions, not the determinant of them. Those decisions are made in light of the incentives and costs faced by the individual decision-makers. Total spending doesn’t figure into their decision-making processes, so what is the point of including it as a variable in the mode? This mistaken preoccupation of Keynesian macroeconomics with aggregate spending has been the central message of Austrian anti-Keynesianism going back at least to Hayek’s 1931 review of Keynes’s Treatise on Money in which Hayek charged that “Mr. Keynes’s aggregates conceal the most fundamental mechanisms of change.” But the assertion that aggregates are irrelevant to individual decisions is not necessarily valid. Businesses decide on how much they are going to invest based on some forecast of the future demand for their products. Is that forecast of future demand independent of what total spending will be in the future? That is a matter of theoretical judgment, not an issue of methodological malpractice. Interest rates, a quintessential market price, the rate at which one can transform current commodities or money units into future commodities or future money units, are not independent of forecasts about the future purchasing power of the monetary unit. But the purchasing power of the monetary unit is another one of those illegitimate aggregate about which Austrians complain. So although I sympathize with Austrian mistrust of overly aggregated macroeconomic models, I am not sure that I agree with their specific criticisms about the meaningfulness and relevance of particular aggregates. So let me offer an alternative criticism of excessive aggregation, but in the context of a different kind of example. Suppose I wish to explain a very simple kind of social interaction in which a decision by one person can lead to a kind of chain reaction followed by a rapid succession of subsequent, but formally, independent, decisions. Think of a crowd of people watching a ball game. The spectators are all seated in their seats. Suddenly something important or exciting happens on the court or the field and almost instantaneously everyone is standing. Why? As soon as one person stands he blocks the vision of the person behind him, forcing that person to stand, causing a chain reaction. For some reason, the action on the field causes a few people to stand. If those people did not stand, no one else would have stood. In fact, even if the first people to stand stood for reasons that had nothing to do with what was happening on the field, the effect would have been the same, because everyone else would have stood; once their vision is blocked by people in front of them, spectators have to stand up to to see the action. But this phenomenon of everyone in a crowd standing when something exciting happens on the ball field happens only with a crowd of spectators of some minimum density. Below that density, not everyone will be forced to stand just because a few people near the front get up from their seats. A similar chain reaction, causing a more serious inefficiency, results when traffic slows down to a crawl on an expressway not because of an obstruction, but just because there is something off to the side of the road that some people are slowing down to look at. The effect only happens, or is at least highly sensitive to, the traffic density on the expressway. If the expressway is sufficiently uncrowded, some attention-attracting sight on the side of the road will cause only a minimal slowdown in the flow of traffic. The point here is that there is something about certain kinds of social phenomena that is very sensitive to certain kinds of interactions between the individuals in the larger group under consideration. The phenomenon cannot be explained unless you take account of how the individuals are interacting. Just looking at the overall characteristics of the group without taking into account the interactions between the individuals will cause you to miss something essential to the process that you are trying to explain. It seems to me that there is something about business-cycle phenomena that is deeply similar to the crowd-like effects in the two examples I gave in the previous paragraph. Aggregation in economic models is not necessarily bad, even Austrians routinely engaging in aggregation in their business-cycle analyses, rarely, for example, discussing changes in the shape of the yield curve, but simply assuming that the entire yield curve rises or falls with “the interest rate.” The question is always a pragmatic one, is the increased tractability of the analysis that aggregation permits worth the impoverishment of the model, by reducing the scope for interactions between the remaining variables. In this respect, it seems to me that real-business cycle models, especially those of the representative-agent ilk, are, by far, the most impoverished of all. I mean can you imagine, a representative spectator or representative-driver model of either of the social interactions described above? So my advice, for whatever it’s worth, to Austrians (and non-Austrians) is to try to come up with explanations for why aggregated models suppress some type of interaction between agents that is crucial to the explanation of a phenomenon of interest. That would be an more useful analytical contribution than simply complaining about aggregation in the abstract. What is a bubble? You certainly can’t know it’s a bubble by just looking at it. You need a model. (i) Write down a model that determines asset prices. (ii) Determine what the actual underlying payoffs are on each asset. (iii) Calculate each asset’s “fundamental,” which is the expected present value of these underlying payoffs, using the appropriate discount factors. (iv) The difference between the asset’s actual price and the fundamental is the bubble. Money, for example, is a pure bubble, as its fundamental is zero. There is a bubble component to government debt, due to the fact that it is used in financial transactions (just as money is used in retail transactions) and as collateral. Thus bubbles can be a good thing. We would not compare an economy with money to one without money and argue that the people in the monetary economy are “spending too much,” would we? Can this be true? Is money fundamentally worth nothing more than the paper it’s printed on (or the bytes that keep track of it in a hard drive)? It’s an interesting and deep question. But my answer is: No. First, consider the following: If money is a pure bubble, than nearly every financial asset is a pure bubble. Why? Simple: because most financial assets entitle you only to a stream of money. A bond entitles you to coupons and/or a redemption value, both of which are paid in money. Equity entitles you to dividends (money), and a share of the (money) proceeds from a sale of the company’s assets. If money has a fundamental value of zero, and a bond or a share of stock does nothing but spit out money, the fundamental value of every bond or stock in existence is precisely zero. Noah is making a good argument, a sort of reductio ad absurdum argument, but I think it’s wrong. The reason is that what Noah is looking at — the real value of non-money assets — is really a ratio, namely the nominal value of an asset divided by the price level measured in terms of the money (unit of account) whose value is supposedly a bubble. Noah says OK, suppose Williamson is right that money is a pure bubble. What would happen once people caught on and figured out that the money that they used to think was valuable is really worthless? Well, when money becomes worthless, the price level is infinite, so the real value of any asset must be zero. Really? I don’t think so. Noah is making a category mistake. Not all financial assets are alike. Some financial assets (bonds) are claims to a fixed stream of payments. But other financial assets (stocks) are claims to a variable stream of payments. Certainly bonds would become worthless as the price level was expected to rise without limit, but why would that be true of stocks? The cash flows associated with stocks would rise along with the increase in the price level. What Noah is doing (I think) is evaluating a ratio, the price of a stock relative to the general price level, as the price level (the inverse of the value of money) goes to infinity. If the denominator is infinite, then the ratio must equal zero, right? Not so fast. Just because the value of the denominator of a ratio goes to infinity does not mean that value of the ratio goes to infinity. That’s a fairly elementary mathematical error. To evaluate the ratio, if both the numerator and denominator are changing, you must look at the behavior of the ratio as the value of the denominator goes to infinity, not just at the denominator in isolation. For a stock, the numerator would go to infinity as the price level rose without limit, so you can’t infer that the real value of the stock goes to zero. So the way to do the thought experiment is to ask what would happen to the value of a stock once people realized that the value of money was going to collapse. The answer, it seems to me, is that people would be trying to exchange their money for real assets, including stocks, as a way of avoiding the loss of wealth implied by the expected drop in the value of money to zero. Under the standard neutrality assumptions, a once and for all reduction in the value of money would imply a proportional increase in all prices. But the bubble case is different, inasmuch as everyone is anticipating the loss of value of money before it takes place, and is therefore trying to switch from holding cash balances to holding real assets. The value of real assets, including financial assets like stocks, would therefore tend to rise faster than the prices of the anticipated service flows embodied in those assets. Asset and stock prices would therefore tend to rise even faster than the general price level, which is to say that the real value of those assets would be rising, not falling, let alone falling to zero, as Noah suggests. So I am sorry, but I don’t think that Noah has succeeded in refuting Williamson. So what is “fundamental value”? Is it consumption value? If that’s the case, then a toaster has zero fundamental value, since you can’t eat a toaster (OK, you can fling it at the heads of your enemies, but let’s ignore that possibility for now). A toaster’s value is simply that it has the capability to make toast, which is what you actually want to consume. So does a toaster have zero fundamental value, or is its fundamental value equal to the discounted expected consumption value of the toast that you will use it to produce? If it’s the latter, then why doesn’t money have fundamental value for the exact same reason? After all, I can use money to buy a toaster, then use a toaster to make toast, then eat the toast. If the toaster has fundamental value, the money should too. Well, the problem here is that the whole question is whether you will be able to buy a toaster with money once people realize that the true value of money is zero. The toaster will remain valuable after money becomes worthless, but money will not remain valuable after money becomes worthless. Nevertheless, the value of a toaster to you is itself not invariant to the tastes and preferences of people other than yourself. Toasters have value only if there are enough other people around that demand sliced bread. If the only kinds of bread that people wanted to eat were baguettes or matzah, your toaster would be worthless. The only goods that have unambiguous consumption value are goods for which there are no network effects. But there are very few such goods, as my toaster example shows. If so, the consumption value of almost any good can be negatively affected if the demand for that good, or for complementary goods, goes down. What you are willing to pay for any asset embodying a future service flow depends on your expectations about the value of that flow. There is no way to define a fundamental value that is independent of expectations, or, as I have previously observed, expectations are fundamental. That is why Keynes’s much reviled comparison, in Chapter 12 of the General Theory, of the stock market to predictions about the outcome of a beauty contest, while surely a caricature, was an insightful caricature. [T]he notion that there must be a “fundamental” source for money’s value, although it’s a right-wing trope, bears a strong family resemblance to the Marxist labor theory of value. In each case what people are missing is that value is an emergent property, not an essence: money, and actually everything, has a market value based on the role it plays in our economy — full stop. I agree with this in spirit, but as an analytical matter, we are still left with the problem of explaining how fiat money can retain a positive value, based on the expectation that someone accepting it now in exchange will, in turn, be able to purchase something else with it further in the future, even though there is a powerful logical argument for why the value of fiat money must eventually fall to zero, in which case backward induction implies that its value falls to zero immediately. Krugman actually alludes to one possible explanation for why the value of fiat money does not immediately fall to zero: the government makes it acceptable as payment for the taxes it imposes, or actually requires that tax obligations be discharged using the currency that it issues. By putting a floor under the current value of money, the creation of a non-monetary demand for money as way of discharging tax liabilities excludes the class of potential equilibria in which the current value of money goes to zero. Brad DeLong spells this out in more detail in his post about Noah Smith and Stephen Williamson. So what is my point? Yes, I agree that money is not a bubble. But merely asserting that money performs a useful social function from which everyone gains is not enough to prove that it is not. That assertion doesn’t explain why that high-value social contrivance is robust. Expectations about the value of money, unless supported by some legal or institutional foundation, could turn pessimistic, and those pessimistic expectations would be self-fulfilling, notwithstanding all the good that money accomplishes. Optimistic expectations about the value of money require an anchor. That anchor cannot be “fundamental value,” because under pessimistic expectations, the “fundamental value” turns out to be zero. That’s why the tax argument, as the great P. H. Wicksteed eloquently explained a century ago, is necessary. It’s time for another installment, after a longer than expected hiatus, in my series of posts summarizing and commenting on Earl Thompson’s path-breaking paper, “A Reformulaton of Macroeconomic Theory.” In the first three installments I described the shift on modeling strategy from the conventional Keynesian IS-LM model adopted by Thompson, and the basic properties of his reformulated model. In the first installment, I explained that Thompson’s key analytic insight was to ground the model in an explicitly neoclassical framework, exploiting the straightforward and powerful implications of the neoclassical theory of production to derive the basic properties of a macroeconomc model structurally comparable to the IS-LM model. The reformulated model shifts the analytic focus from the Keynesian spending functions to the conditions for factor-market equilibrium in a single-output, two-factor model. In the second installment, I explained how Thompson drew upon the Hicksian notion of temporary equilibrium for an explicit treatment of Keynesian (involuntary) unemployment dependent on incorrect (overly optimistic) expectations of future wages. While the model allows for inefficient (relative to correct expectations) choices by workers to remain unemployed owing to incorrect expectations, the temporary equilibrium nevertheless involves no departure from market clearing, and no violation of Walras’s Law. In the third installment, I described the solution of the model, deriving two market-equilibrium curves, one a locus of points of equilibrium (combinations of price levels and nominal interest rates) in the two factor markets (for labor and capital services) and one a locus of points of money-market equilibrium (again in terms of price levels and nominal interest rates) using the standard analytic techniques for deriving the Keynesian IS and LM curves. Although not exactly the same as the Keynesian LM curve (constructed in income-interest-rate space), the locus of points of monetary equilibrium, having a similar upward slope, was assigned the familiar LM label. However, unlike the Keynesian IS curve it replaces, the locus of points, labeled FF, of factor-market equilibrium is positively sloped. The intersection of the two curves determines a temporary equilibrium, characterized by a price level, a corresponding level of employment, and for a given expected-inflation parameter, a corresponding real and nominal interest rate. The accompanying diagram, like Figure 4 in my previous installment, depicts such a temporary-equilibrium solution. I observed in the previous installment that applying Walras’s Law allows another locus of points corresponding to equilibrium in the market for the single output, which was labeled the CC curve (for commodity market equilibrium) by Thompson. The curve would have to lie in the space between the FF curve and the LM curve, where excess demands in each market have opposite (offsetting) signs. The CC curve is in some sense analogous to the Keynesian IS curve, but, as I am going to explain, it differs from the IS curve in a fundamental way. In the accompnaying diagram, I have reproduce the FF and LM curves of the with reformulated model with the CC curve drawn between the FF and LM curves. The slope of the CC curve is clearly positive, in contrast to the downward slope normally attributed to the Keynesian IS curve. In this post, I am going to discuss Thompson’s explanation of the underlying connection between his reformulated macroeconomic model and the traditional Keynesian model. At a formal level, the two models share some of the same elements and a similar aggregative structure, raising the question what accounts for the different properties of the two models and to what extent can the analysis of one model be translated into the terms of the other model? Aside from the difference in modeling strategy, focusing on factor-market equilibrium instead of an aggregate spending function, there must be a deeper underlying substantive difference between the two models, otherwise the choice of which market to focus on would not matter, Walras’s Law guaranteeing that anyone of the n markets can be eliminated without changing the equilibrium solution of a system of excess demand equations. So let us look a bit more closely at the difference between the Keynesian IS curve and the CC curve of the reformulated model. 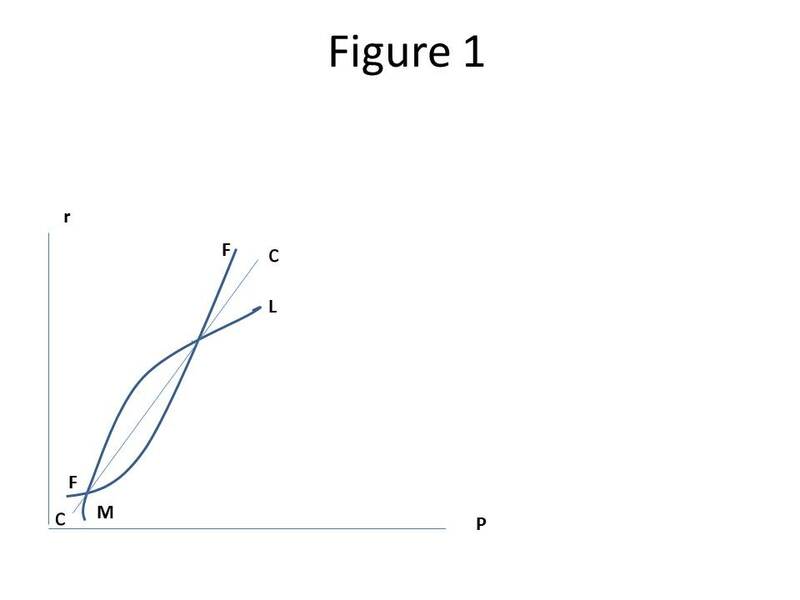 The most basic difference is that the CC curve relates to a stock equilibrium, with an equilibrating value of P in the market for purchasing the stock of commodities, representing the equilibrium market value of a unit of output. On the other hand, the Keynesian IS curve is measuring a flow, the rate of aggregate expenditure, the equilibrium corresponding to a particular rate of expenditure. Thompson sums up the underlying difference between the Keynesian model and the reformulated model in two very dense paragraphs on pp. 16-17 of his paper under section heading “The role of aggregate spending and the Keynesian stock-flow fallacy.” I will quote the two paragraphs in full and try to explain as best as I can, what he is saying. All of this is not to say that the flow of aggregate spending is irrelevant to our temporary equilibrium. The expected rate of inflation [as already noted a crucial parameter in the reformulated model] may depend parametrically upon the expected rate of spending. Then, an increase in the expected rate of spending on consumption or investment (or, more generally, an increase in the expected future excess demand for goods at the originally expected prices) would, by increased Pe [the expected price level] and thus r [the nominal interest rate] for a given R/P [the ratio of the rental price of capital to the price of capital, aka the real interest rate], shift up the FF curve. In a Modern Money Economy [i.e., an economy using a non-interest-bearing fiat money monopolistically supplied by a central bank], this shift induces a movement out of money [because an increase in the nominal interest rate increases the cost of holding non-interest-bearing fiat money] in the current market (a movement along the LM curve) and a higher current price level. This exogenous treatment of spendings variables, while perhaps most practical from the standpoint of business cycle policy, does not capture the Keynesian concept of an equilibrium rate of expenditure. In order to obtain an equilibrium rate of expenditures – and thus an equilibrium rate of capital accumulation [aka investment, how much output will be carried over to next period] – a corresponding price variable must be added. The only economically natural price to introduce to equilibrate the demand and supply of next period’s capital goods is the price of next period’s capital goods. [In other words, how much of this period’s output that people want to hold until next period depends on the relationship between the current price of the output and the expected price in the next period.] This converts Pe into an equilibrating variable. Indeed, Section III below will show that if Pe is made the equilibrating price variable, making the rate of inflation an independently equilibrating variable rather than an expectations parameter determined by other variables in the system and extending the temporary equilibrium to a two-period equilibrium model in which only prices in the third and later periods may be incorrectly expected in the current period, the Keynesian expenditures condition, the equality of ex ante savings and investment, is indeed achieved. However, Section III will also show that the familiar Keynesian comparative statics results that are based upon a negatively sloped IS curve fail to hold in the extended model just as they fail in the above, single period model. The upshot of Thompson’s argument is that you can’t have a Keynesian investment function without introducing an expected price for capital in the next period. Without an expected price of output in the next period, there is nothing to determine how much investment entrepreneurs choose to undertake in the current period. And if you want to identify an equilibrium rate of expenditure, which means an equilibrium rate of investment, then you must perforce allow the expected price for capital in the next period to adjust to achieve that equilibrium. I must admit that I have been struggling with this argument since I first heard Earl make it in his graduate macro class almost 40 years ago, and it is only recently that I have begun to think that I understand what he was getting at. I was helped in seeing his point by the series of posts (this, this, this, this, this, this, this, and this) that I wrote earlier this year about identities and equilibrium conditions in the basic Keynesian model, and especially by the many comments and counterarguments that I received as a result of those posts. The standard Keynesian expenditure function is hard to distinguish from an income function (which also makes it hard to distinguish investment from savings), which makes it hard to understand the difference between expenditure being equal in equilibrium and being identical to savings in general or to understand the difference between savings and investment being equal in equilibrium and being identical in general. There is a basic problem in choosing define an equilibrium in terms of two magnitudes so closely related as income and expenditure. The equilibrating mechanism doesn’t seem to be performing any real economic work, so it hard to tell the difference between an equilibrium state and a disequilibrium state in such a model. Thompson may have been getting at this point from another angle by focusing on the lack of any equilibrating mechanism in the Keynesian model, and suggesting that an equilibrating mechanism, the expected future price level or rate of inflation, has to be added to the Keynesian model in order to make any sense out of it. In my next installment, I will consider Thompson’s argument about the instability of the equilibrium in the FF-LM model. Even though he has written that he no longer considers himself an Austrian economist, George Selgin remains sympathetic to the Austrian theory of business cycles, and, in accord with the Austrian theory, still views recessions and depressions as more or less inevitable outcomes of distortions originating in the preceding, credit-induced, expansions. In a recent post, George argues that the 2002-06 housing bubble conforms to the Austrian pattern in which a central-bank lending rate held below the “appropriate,” or “natural” rate causes a real misallocation of resources reflecting the overvaluation of long-lived capital assets (like houses) induced by the low-interest rate policy. For Selgin, it was the Fed’s distortion of real interest rates from around 2003 to 2005 that induced a housing bubble even though the rate of increase in nominal GDP during the housing bubble was only slightly higher than the 5% rate of increase in nominal GDP during most of the Great Moderation. Consequently, responses by Marcus Nunes, Bill Woolsey and Scott Sumner to Selgin, questioning whether he used an appropriate benchmark against which to gauge nominal GDP growth in the 2003 to 2006 period, don’t seem to me to address the core of Selgin’s argument. Selgin is arguing that the real distortion caused by the low-interest-rate policy of the Fed was more damaging to the economy than one would gather simply by looking at a supposedly excessive rate of nominal GDP growth, which means that the rate of growth of nominal GDP in that time period does not provide all the relevant information about the effects of monetary policy. So to counter Selgin’s argument – which is to say, the central argument of Austrian Business-Cycle Theory – one has to take a step back and ask why a price bubble, or a distortion of interest rates, caused by central-bank policy should have any macroeconomic significance. In any conceivable real-world economy, entrepreneurial error is a fact of life. Malinvestments occur all the time; resources are, as a consequence, constantly being reallocated when new information makes clear that some resources were misallocated owing to mistaken expectations. To be sure, the rate of interest is a comprehensive price potentially affecting how all resources are allocated. But that doesn’t mean that a temporary disequilibrium in the rate of interest would trigger a major economy-wide breakdown, causing the growth of real output and income to fall substantially below their historical trend, perhaps even falling sharply in absolute terms. The Austrian explanation for this system-wide breakdown is that the price bubble or the interest-rate misallocation leads to the adoption of investments projects and of production processes that “unsustainable.” The classic Austrian formulation is that the interest-rate distortion causes excessively roundabout production processes to be undertaken. For a time, these investment projects and production processes can be sustained by way of credit expansion that shifts resources from consumption to investment, what is sometimes called “forced saving.” At a certain point, the credit expansion must cease, and at that point, the unsustainability of the incomplete investment projects or even the completed, but excessively roundabout, production processes becomes clear, and the investments and production processes are abandoned. The capital embodied in those investment projects and production processes is revealed to have been worthless, and all or most of the cooperating factors of production, especially workers, are rendered unemployable in their former occupations. Although it is not without merit, that story is far from compelling. There are two basic problems with it. First, the notion of unsustainability is itself unsustainable, or at the very least greatly exaggerated and misleading. Why must the credit expansion that produced the interest-rate distortion or the price bubble come to an end? Well, if one goes back to the original sources for the Austrian theory, namely Mises’s 1912 book The Theory of Money and Credit and Hayek’s 1929 book Monetary Theory and the Trade Cycle, one finds that the effective cause of the contraction of credit is not a physical constraint on the availability of resources with which to complete the investments and support lengthened production processes, but the willingness of the central bank to tolerate a decline in its gold holdings. It is quite a stretch to equate the demand of the central bank for a certain level of gold reserves with a barrier that renders the completion of investment projects and the operation of lengthened production processes impossible, which is how Austrian writers, fond of telling stories about what happens when someone tries to build a house without having the materials required for its completion, try to explain what “unsustainability” means. The original Austrian theory of the business cycle was thus a theory specific to the historical conditions associated with classical gold standard. Hawtrey, whose theory of the business cycle, depended on a transmission mechanism similar to, but much simpler than, the mechanism driving the Austrian theory, realized that there was nothing absolute about the gold standard constraint on monetary expansion. He therefore believed that the trade cycle could be ameliorated by cooperation among the central banks to avoid the sharp credit contractions imposed by central banks when they feared that their gold reserves were falling below levels that they felt comfortable with. Mises and Hayek in the 1920s (along with most French economists) greatly mistrusted such ideas about central bank cooperation and economizing the use of gold as a threat to monetary stability and sound money. However, despite their antipathy to proposals for easing the constraints of the gold standard on individual central banks, Mises and Hayek never succeeded in explaining why a central-bank expansion necessarily had to be stopped. Rather than provide such an explanation they instead made a different argument, which was that the stimulative effect of a central-bank expansion would wear off once economic agents became aware of its effects and began to anticipate its continuation. This was a fine argument, anticipating the argument of Milton Friedman and Edward Phelps in the late 1960s by about 30 or 40 years. But that was an argument that the effects of central-bank expansion would tend to diminish over time as its effects were anticipated. It was not an argument that the expansion was unsustainable. Just because total income and employment are not permanently increased by the monetary expansion that induces an increase in investment and an elongation of the production process does not mean that the investments financed by, and the production processes undertaken as a result of, the monetary expansion must be abandoned. The monetary expansion may cause a permanent shift in the economy’s structure of production in the same way that tax on consumption, whose proceeds were used to finance investment projects that would otherwise not have been undertaken, might be carried on indefinitely. So the Austrian theory has never proven that forced saving induced by monetary expansion, in the absence of a gold-standard constraint, is necessarily unsustainable, inevitably being reversed because of physical constraints preventing the completion of the projects financed by the credit expansion. That’s the first problem. The second problem is even more serious, and it goes straight to the argument that Selgin makes against Market Monetarists. The whole idea of unsustainability involves a paradox. The paradox is that unsustainability results from some physical constraint on the completion of investment projects or the viability of newly adopted production processes, because the consumer demand is driving up the costs of resources to levels making it unprofitable to complete the investment projects or operate new production processes. But this argument presumes that all the incomplete investment projects and all the new production processes become unprofitable more or less simultaneously, leading to their rapid abandonment. But the consequence is that all the incomplete investment projects and all the newly adopted production processes are scuttled, producing massive unemployment and redundant resources. But why doesn’t that drop in resource prices restore the profitability of all the investment projects and production processes just abandoned? It therefore seems that the Austrian vision is of a completely brittle economy in which price adjustments continue without inducing any substitutions to ease the resource bottlenecks. Demands and supplies are highly inelastic, and adjustments cannot be made until prices can no longer even cover variable costs. At that point prices collapse, implying that resource bottlenecks are eliminated overnight, without restoring profitability to any of the abandoned projects or processes. Actually the most amazing thing about such a vision may be how closely it resembles the vision of an economy espoused by Hayek’s old nemesis Piero Sraffa in his late work The Production of Commodities by Means of Commodities, a vision based on fixed factor proportions in production, thus excluding the possibility of resource substitution in production in response to relative price changes. A more realistic vision, it seems to me, would be for resource bottlenecks to induce substitution away from the relatively scarce resources allowing production processes to continue in operation even though the value of many fixed assets would have to be written down substantially. Those write downs would allow existing or new owners to maintain output as long as total demand is not curtailed as a result of a monetary policy that either deliberately seeks or inadvertently allows monetary contraction. Real distortions inherited from the past can be accommodated and adjusted to by a market economy as long as that economy is not required at the same time to undergo a contraction, in total spending. But once a sharp contraction in total spending does occur, a recovery may require a temporary boost in total spending above the long-term trend that would have sufficed under normal conditions.